The Encores! production was produced on Broadway at the St. James Theatre. Previews started March 3, 2008, with the official opening March 27. 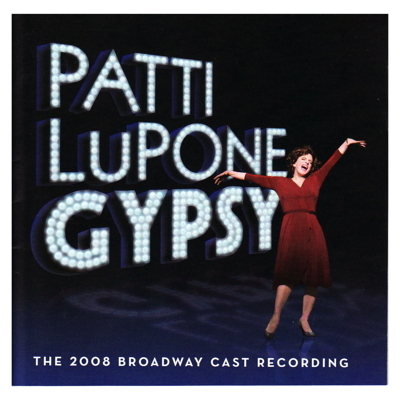 The production closed on January 11, 2009 after 332 performances and 27 previews, and featured Patti LuPone (Rose), Boyd Gaines (Herbie), Laura Benanti (Louise) and Leigh Ann Larkin (Dainty June), with Arthur Laurents directing and Bonnie Walker reproducing the original choreography by Jerome Robbins. They are joined by Tony Yazbeck as Tulsa, Marilyn Caskey as Electra, Alison Fraser as Tessie, and Lenora Nemetz as Mazeppa with Sami Gayle as Baby June and Emma Rowley as Baby Louise. The set is designed by James Youmans, costumes by Martin Pakledinaz and lighting by Howell Binkley. On the eve before the final curtain call, Patti Lupone made news when she literally stopped the show to scold a patron for taking illegal photographs during the matinee performance. "You see, everyone's starved for attention in 'Gypsy.' That craving, after all, is the motor that keeps showbiz puttering along. And Mr. Laurents makes sure that we sense that hunger in everyone.... I was so caught up in the emotional wrestling matches between the characters (and within themselves), that I didn't really think about the songs as songs.... There is no separation at all between song and character, which is what happens in those uncommon moments when musicals reach upward to achieve their ideal reasons to be." This production won three Tony Awards and three Drama Desk Awards, in each case for the performances by Lupone, Gaines and Benanti.